Advent is the traditional church season that celebrates Jesus’ first arrival (or advent) at Christmas. It begins the fourth Sunday from Christmas Day and works its way to Christmas morn. I love it because in a culture that commodifies and consumerizes every holiday it can get it hands on, celebrating Advent intentionally focuses my family on the real meaning of Christmas by calling us to remember, anticipate, and ultimately worship the Child who comes to make all things new. One of the ways our family leverages the Advent season is by using an Advent wreath. Advent wreaths have been around the church for literally centuries as a way to help Christians engage the themes that flow in and around the birth of Jesus. 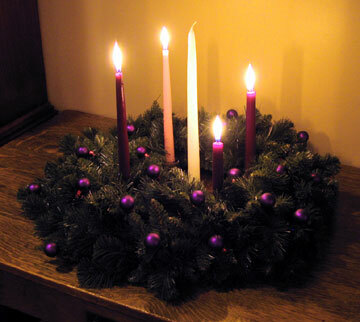 While there are variations on its composition, many construct a wreath that within its circle has four candles (three purple, one pink[ref]Pink is the traditional color of the third candle because, in history past, Advent was used as a preparatory fast for Christmas Day. This means the season was primarily penitential or somber in tone. Purple is the traditional color of penitential seasons, which translates into purple candles. However, since the third week focuses on Joy, the church decided to use a different color (pink or rose) as a “break” from the penitential theme Advent originally carried. Now you know 😉 [/ref]), each representing the Advent themes of hope, love, joy, and peace. There is a central white candle which represents Christ. We have the kids read passages from the Bible that intersect Christ’s birth and the hope he gives us in it. It’s usually no more than one section of Scripture. We have prayers both from our children and either mom or dad. Our time concludes with me saying aloud, “In the advent of Jesus we are reminded that Jesus has come to bring us…?” and the kids shout back that Sunday’s theme, “Hope!” with each of them trying to blow the candle out before the other. Our entire time together doesn’t last more than ten or so minutes but I’ve come to see how important those minutes are with my family as it concerns trying to disciple my kids in Jesus during this season. It’s a great way to slow us down and focus on what Christmas is all about. I also like the fact that in celebrating Advent I’m joining the church around the world and over history. I’m connected to something bigger than just me. I’ve also found our boys love doing this. They dig the dark house with the solitary candle as our light. They think it’s a kick to read the Bible for mom and dad. They even like singing carols together. They especially want to see who will be the kid who beats his brothers in blowing out the candle (or candles, depending on how many weeks you are into Advent). They love that it builds each week and have a better grasp on the anticipation that the Advent season brings. For my wife and me, the Advent wreath is simply one more tool we have at our disposal to redeem the season which constantly finds itself being bombarded by other, lesser messages. That’s why for The Arringtons, as December edges around the corner, one of the first things we’ll put together in preparation for the holiday season is our Advent wreath in the hopes that this Christmas holiday we will continue to dwell upon the One in whom we find our ultimate hope, love, joy, and peace. If you haven’t used an Advent wreath before, give it a try and see if it blesses your holiday as well. Thank you CCC for yet another way to ground us to Christ. Every year it seems society adds something else to take away the reason for the celebration of our beloved redeemer. The advent wreath is a great way to teach our children the importance of Jesus being first during this holiday season.